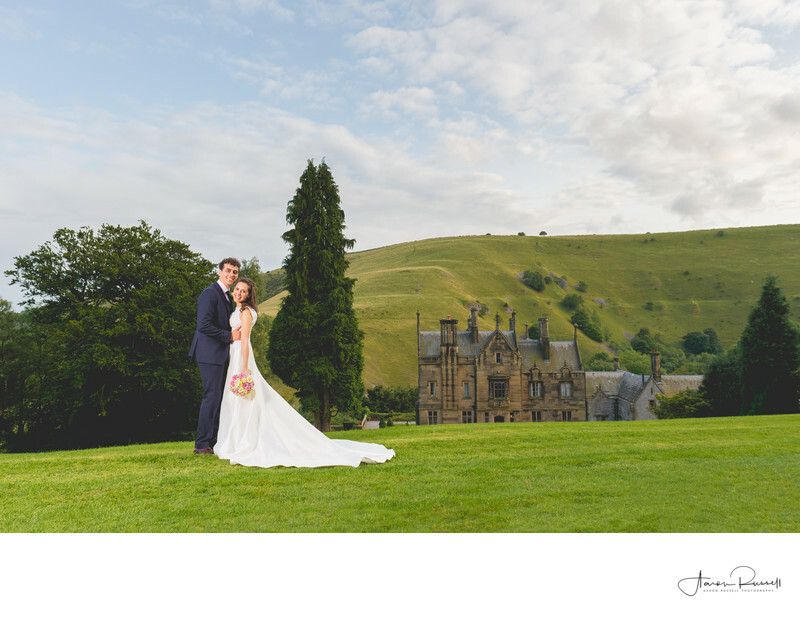 Cressbrook Hall is Derbyshire is one of my favourite wedding venues, and I was over the moon when Gavin and Sara asked me to be their wedding photographer. The venue itself is as beautiful as it is vast, as is the Derbyshire Peak District in which it sits. Gavin and Sara both got ready at the venue too, which made the day very relaxed as no travel was involved. Getting ready at the Hall also meant that the couple got to look out over the Derbyshire countryside all morning as well as during their amazing outdoor wedding. My associate photographer and I had already spent about 30 minutes with the bride and groom, taking their couples photos in and around the venue. I knew from my first visit to Cressbrook Hall that I wanted to take a photo at the front of the wedding venue, to really show the Hall off in all of it's stunning surroundings. A small bank leads up and away from the hall, and its here that I chose to take these photos. With the bride and groom ideally placed so that the wedding dress naturally leads your eye into the image, I started taking photos but something was missing; that added detail that brings everything to life - light. It was a very bright day and the contrast caused by the overhead sun was a little much for my liking. Not to worry though - I had my associate photographer hold one of my Profoto B1 studio flashlights to the side of the couple in order that I could light them sufficiently to lift them from the image. I exposed for the ambient light conditions initially and then took the exposure down a further stop in order to make the background a little darker, allowing the light to really shine on the most important things in the image - the bride and groom!